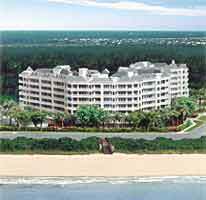 Jupiter Ocean Grande includes four 8-story residential towers overlooking the Atlantic Ocean, designed in the distinctive style of Old Florida’s Victorian architecture. Jupiter Ocean Grande offers a wide selection of unique floor plans – with up to 2,500 square feet of living space – and prices for the luxury residences range from the mid $600’s to over $800,000. With gracious porte-cochere entry at each building and main lobby with semi-private elevators serving a maximum of three residences per floor,panoramic ocean and sunset vistas from all principal rooms [The Grande Mar and Grande Bay models do not have sunset terraces],expansive great rooms which open onto wide spacious terraces overlooking the water, a view that is shared by the master bedroom suite,formal ceramic-tiled foyers which lead into open interiors that may feature two or three bedrooms, private den, gourmet kitchen, and guest suites,complete amenities package including heated pool, spa, two lighted tennis courts, as well as catering kitchens, card rooms, billiard rooms, fitness centers and meeting rooms,two levels of secured underground parking provide two spaces for each residence. Need More Information? Use the form below or contact me by phone at (561) 358-5508.